Minerve is a picturesque village 25 kilometres north-west of Narbonne in Languedoc-Roussillon, that is classed as one of the 'most beautiful villages of France'. The village is above the gorge carved by the River Cesse before it disappears underground into a natural tunnel. 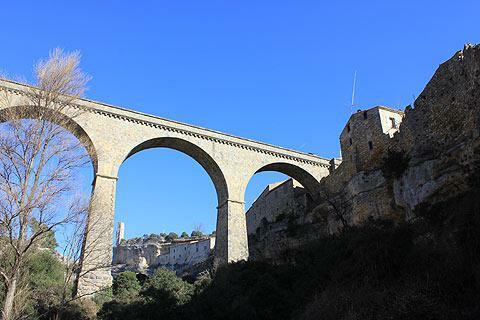 The fortified medieval village, with many of the fortifications still in place, is perched on a naturally defended rocky peninsula high above a canyon in the barren Languedoc landscape. 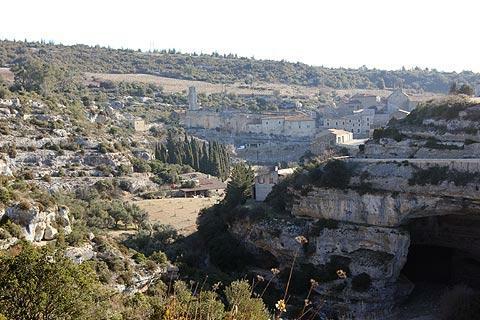 You will better appreciate your visit to Minerve if you have a bref knowledge of the history of the village. The most infamous event took place here in the early 13th century. In 1210 a group of cathars escaped from Béziers that was under attack in the Albigensian crusade and found refuge in this heavily fortified village. It took the brutal Simon de Montfort six weeks of siege, but eventually the village gave in after a catapult bombardment destroyed the only well in the village (the Puits Saint-Rustique). 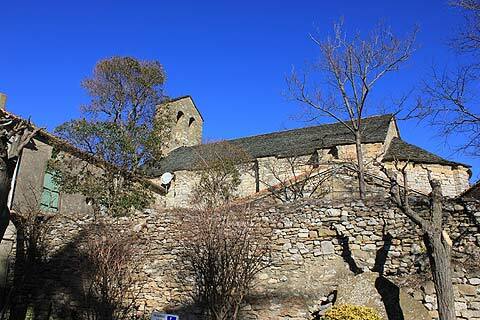 Following the surrender of the town 140 cathars were burned at the stake. 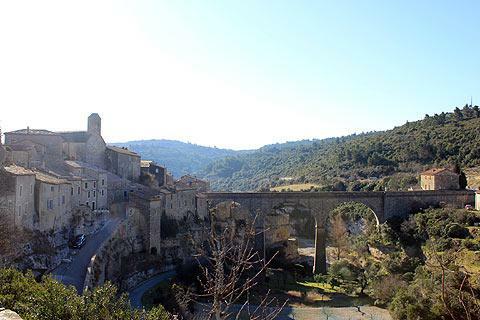 Things are slightly more tranquil nowadays, and Minerve is an attractive village to visit and explore, with narrow streets winding between old stone houses. Cars must park at the car park just outside of the village and the entrance to Minerve is next to the remains of the castle that once stood here. The Candela (castle) dates back to the 13th century but today it is just the tall octagonal column which remains. Near the castle you an see the very ancient (11th century) roman style Church of Saint Etienne that stands at the top of the village. Its altar is thought to date back to the year 456. 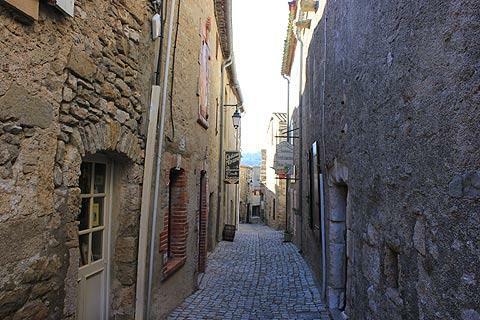 Next to Minerve tourist office is the Martyrs road along which it is thought the Cathars walked on their way to the stake. One of the houses on the street belonged to the House of the Templiers. One of the original gateways into the town can also be seen. 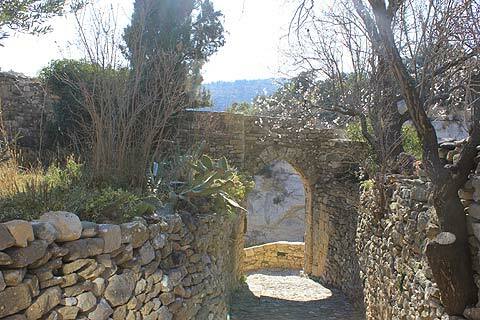 This is the 'Porta Bassa' and was one of the two main gateways into Minerve. Take the path down to the river bed from here and then walk along the riverbed towards the lovely old stone bridge which crosses the gorge. Below this you can see a natural bridge in the rock of the cliff-face. Back up the hill in the town walk to the other side of the town where you can see the gorge from another angle and see a large remaining section of the fortified walls. Across the river from here is a reconstruction of a medieval weapon called a birdtrap or a 'malvoisine'. This flung rocks from across the gorge to the walls of Minerve and the well of Minerve. 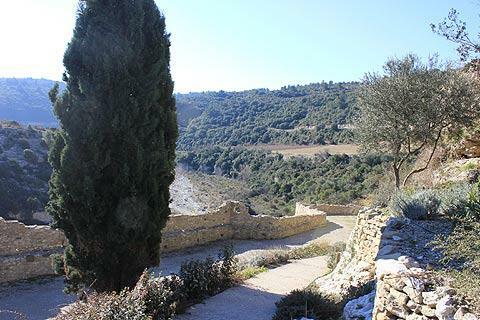 The region around Minerve has been occupied since prehistory, and some of the artefacts from the area can be seen in the small Museum of Archaeology and Prehistory in Minerve (small entry charge payable). While here, try and find time for a walk or two in the surrounding region - the paths and tracks around the nearby cliffs are a great introduction to the countryside of the area. 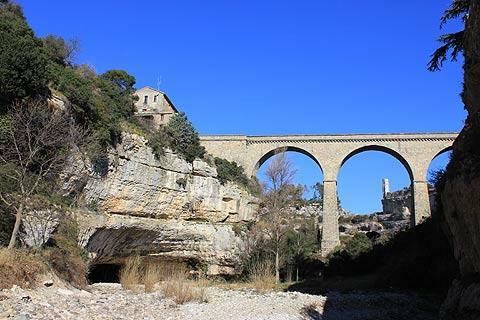 The landscape around the village is of gorges, causses and cliffs, often forested, which creates a very lovely environment to explore on foot or by bike. 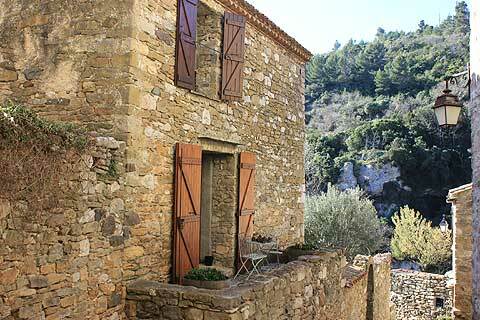 You will also see the vineyards, Minerve having given its name to the famous wine of the region, Minervois. 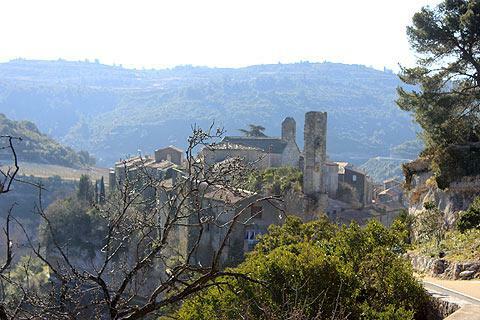 Within the quiet valleys you will come across numerous small hamlets and villages that also merit an exploration such as Aigne, La Liviniere, Cesseras, Beaufort, Siran and Azillanet among others. 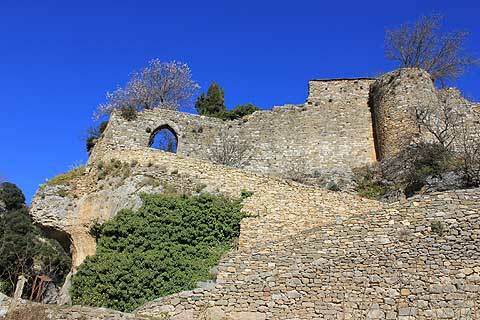 You can find more local travel ideas in the Herault guide and the Languedoc-Roussillon guide.